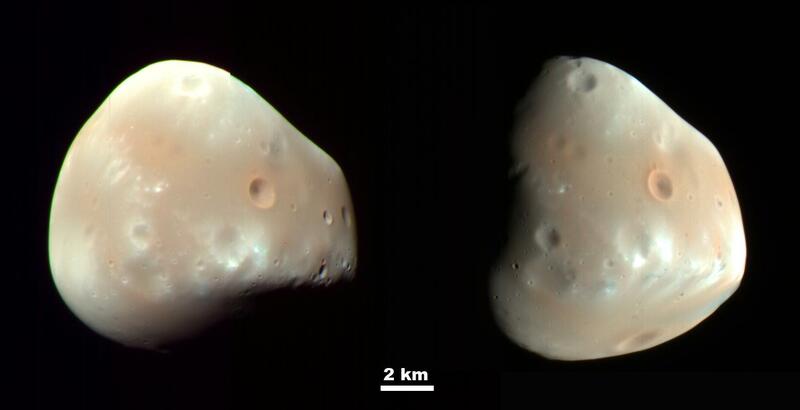 These color-enhanced views of Deimos, the smaller of the two moons of Mars, result from imaging on Feb. 21 by the High Resolution Imaging Science Experiment (HiRISE) camera on NASA's Mars Reconnaissance Orbiter. Deimos has a smooth surface due to a blanket of fragmental rock or regolith, except for the most recent impact craters. It is a dark, reddish object, very similar to Mars' other moon, Phobos. These Deimos images combine HiRISE exposures in near-infrared, red and blue-green wavelengths. In the enhanced color, subtle color variations are visible�redder in the smoothest areas and less red near the fresh impact craters and over ridges of topographic highs (relative to Deimos' center of gravity). The color variations are probably caused by exposure of surface material to the space environment, which leads to darkening and reddening. Brighter and less-red surface materials have seen less exposure to space due to recent impacts or downslope movement of regolith. 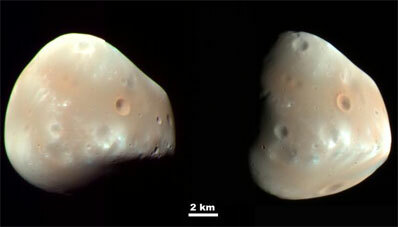 Deimos is about 12 kilometers (7.5 miles) in diameter. Its orbital period is 1 day, 6 hours, 17.9 minutes. These two images were acquired 5 hours and 35 minutes apart. The sun was to the upper left in the first (left) image, and to the right in the second image. The viewing geometry is similar in the two images, but surface features appear very different due to the change in illumination. With an image scale of about 20 meters (66 feet) per pixel, features 60 meters (197 feet) or larger can be discerned.